The Long-Range Planning Committee of the General Service Board will host a series of four phone forums during the 2018-2019 World Service Conference year to provide an opportunity for members to learn about and discuss the Twelve Traditions of Debtors Anonymous. Current and former members of the General Service Board will each share their experience, strength, and hope on one of these three Traditions. This portion of the call will be recorded. Participants will have time to ask questions and make comments. The question and comment portion of the call will not be recorded. Playback of the speaker portion of all Fellowship-wide calls are available as podcasts on the D.A. website (when made available). Bringing D.A.literature & posters to churches, meeting places, & more! After the speaker presentations, callers will be given the opportunity to participate in shares and Q&A. “We will recognize that there is enough; our resources will be generous and we will share them with others and with D.A.” The focus of the call will be sharing by three members of the Fellowship on how the impact of Promise 7 has strengthened their program and enhanced their personal lives. The speaker portion of the call will be recorded. Participants will have time to ask questions and make comments following the speakers’ shares. The question and comment portion of the call will not be recorded. We pay our bills and invoice our clients promptly. We put all our business agreements in writing and write our own Letters of Agreement. We notice the competition but don’t worry about it. We learn from our competitors and trust that it is an abundant universe with more than enough for everyone. Each speaker will share their experience, strength, and hope for 15 minutes on each BDA tool. After the speaker presentations, callers will be given the opportunity to participate in timed shares. Some charges may apply, depending on your phone service. Web-based phone alternatives are available. The Statement of Purpose of Debtors Anonymous reads: In D.A., our purpose is threefold: to stop incurring unsecured debt, to share our experience with the newcomer, and to reach out to other debtors. & KINDLY FORWARD THIS E-MAIL TO OTHER D.A. MEMBERS. Three dynamic speakers share their experience, strength & hope on how they moved from inhibition and embarrassment in their thinking and action around money to receiving the Twelve Promises of D.A. For a downloadable copy of the call information, please click HERE. IT’S COOL TO BE HIP! Help spread the message to the debtor who still suffers in Hospitals, Institutions, & Prisons. Many members like you have added great joy and depth to their own program by working with debtors who do not have the opportunity to attend regular meetings because they are confined within hospital, institution and prison systems. Become a HIP rep for your group and reach out to a HIP location near you. attending this call. We will be referring to it throughout the session. Put it in your diaries – More information soon! 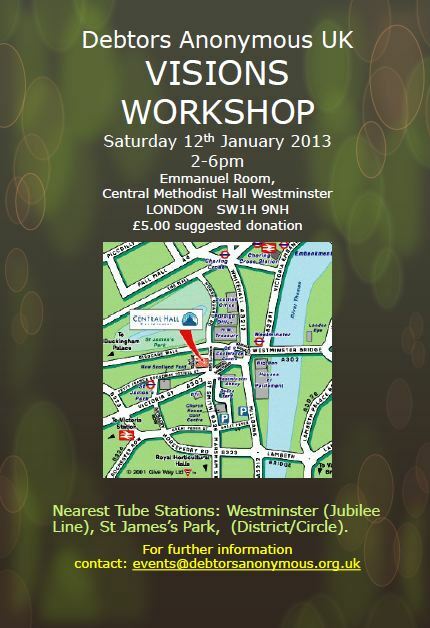 There are workshops on the steps at World Service Conference on Saturday 4 August. You can attend by calling a UK phone number- listed below. Add 5 hours for the UK time. For the eighth year running, a portion of the Fellowship Day at the annual Debtors Anonymous World Service Conference will be available to D.A. members worldwide via telephone conference call. The workshops will be conducted live in Bloomington, MN, USA, where the Conference is meeting August 1-5. Fellowship Day this year is on Saturday, August 4. Four workshops, each focused on several of D.A.’s Twelve Steps, will be offered in 45-minute segments. 1. We keep separate professional and personal financial records and bank accounts. 2. We write annual one-year business plans with definable and accountable goals and targets. 3. We keep clean, orderly and accurate financial records, including Accounts Receivable, Accounts Payable, Cash on Hand, Inventory, Assets, and Outstanding Debts, and put all tax and bill due dates on our calendar. 4. We pay ourselves a salary including benefits ,medical insurance, vacations and sick days. 5. We remain mindful that dollars spent should generate revenue and compare prices before making purchases. 6. We maintain clarity about the overhead and profit margins of every product or service we sell. Each speaker will share their experience, strength, and hope for 15 minutes each on two BDA tools. After the speaker presentations, callers will be given the opportunity to participate in timed shares. Intergroup asks each DA group to consider having a Gratitude week in the month of June, to support World Service. We suggest a collection separate from the usual Tradition 7 collection, to be sent to the Intergroup Treasurer clearly marked as a Gratitude Donation and with your group name. The treasurer will then forward all money collected to World Service. The focus of this call will be on how to carry the DA message in line with the traditions. Three members of the Fellowship will share their experience, strength and hope on how these three aspects of Public Information service have impacted their recovery. the Message” and/or Public Information Work? This portion of the call will be recorded. Participants will have time to ask questions and make comments. The question and comment portion of the call will not be recorded. Please share at your meetings. If you miss the call you can listen to the recording call 0330 390 2123 access code 796199. How can FAITH and practicing STEP 3 improve my business? help a person move beyond fear? Each speaker will share their experience, strength and hope for 15 minutes on one of the above topics. After the speaker presentations, callers will be given the opportunity to participate in timed shares. A series of four phone forums during the 2017-2018 Conference year provide an opportunity to learn about and ask questions about D.A. and service. The focus of this call will be on “Solvency and Sponsorship.” Three members of the Fellowship will share their experience, strength and hope on how solvency and sponsorship have impacted their recovery. This portion of the call will be recorded. Participants will have time to ask questions and make comments. The question and comment portion of the call will not be recorded. Participants: Training will be open to all D.A. members, both those who wish to learn how to respond to requests by the media for information about D. A., and members who would like to learn more about how to discuss D.A. with people outside of the Fellowship. Purpose of This Call: To train D.A. members who may wish to respond to inquiries from the media about D.A. page 18 – History of D.A. If we come to Debtors Anonymous with unsecured debt we often feel in chaos and fear around it. It does not matter how much we owe, it is the impact on our lives that is often destructive and damaging. In this workshop will look at how we chose to communicate with our creditors, the calculation of our repayment schedule and the pace at which we reduce our debt. We will use handouts and DA literature as well as share our experience strength and hope. In the spirit of our recovery we will affirm our commitment to making amends whilst never neglecting our own self care and needs. Open Sharing: After the speakers, we will have open sharing for 2 minutes each. After the call, attendees can stay on the line to exchange contact information. Open sharing will not be recorded. The Steps Workshop due to take place on Saturday 04 November has been cancelled due to illness. HOW CAN SELF CARE IMPROVE MY BUSINESS? Speaker will address issues such as paying yourself a salary, medical insurance, prudent reserve, vacations, sick days, retirement plans, and dealing with difficult and poor-paying clients. WHAT HAPPENS WHEN I PUT MONEY BEFORE SPIRITUALITY? Speaker will address spiritually sustainable earning, their connection with a higher power, and why money is not their higher power. HOW DOES GRATITUDE CREATE A PROSPEROUS BUSINESS? Speaker will focus on how a mindful shift to an “attitude of gratitude” affects all aspects of our business, including putting our needs first and creating more clarity with our business. This call will include three speakers, each sharing their experience, strength and hope for 15 minutes on one of the above topics. After the speaker presentations, callers will be given the opportunity to participate in timed shares. 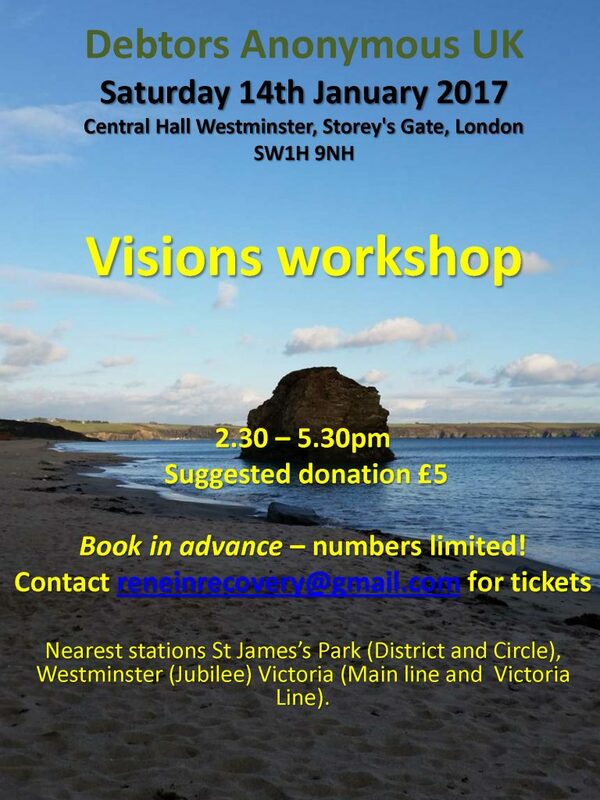 This Fellowship-wide call will explore the many levels in which having a clear vision can contribute to spiritual growth and our individual capacities for abundance. Many of us came into DA in a state of complete helplessness and hopelessness – stuck in a restricted life where we were constantly gasping for breath. Accompanied with the steps and tools of DA, being willing to explore and move toward our visions can result in profound displays of DA’s promises. Come join us in to hear personal stories of visions realized, and how three members moved from a life of unmanageability to a life of dreams and visions realized. Through recovery, as we align our will with a Power Greater than ourselves, we begin to live our deepest visions, sometimes in unexpected ways, and find freedom, happiness, and serenity, beyond our wildest dreams. Participants – Worldwide Debtors Anonymous Members at all service levels and especially Newcomers. Some charges may apply, depending on your phone service. Web-based phone alternatives are available. See list below for international numbers. Dates will be announced once they are finalized. Please share this announcement at your meetings. Please forward this e-mail to other D.A. members. The purpose of a pressure relief meeting is to review our financial situation, help restore manageability to our financial lives, and thereby provide support for our recovery from compulsive debting. In February 2017, the Chair of the General Service Board convened an ad hoc committee to address the Fellowship’s $48,000.00 projected deficit in our FY 17 spending plan. The members of the ad hoc committee realize this situation is far from ideal. Debtors Anonymous has recently accessed a portion of our prudent reserve to address the shortfall. Although the Fellowship has not incurred unsecured debt, we realize our current course of spending will not be sustainable. To this end, the ad hoc committee is asking for active participation from our Fellowship in a pressure relief-style conference call. All members of the D.A. Fellowship. The Fourth, Fifth, and Tenth Tools of The Twelve Tools of D.A. Due to Success of Figures Workshop in early June 2017, Sabrina has offered to repeat this event. Please don’t just show, up as it’s strictly only 30 with advance tickets! We are carrying on our tradition of ‘One member, one action’ for the month of April. If every member took just one action, imagine the impact it would have on carrying the DA message to the debtor who still suffer. Could you call a newcomer, sponsor a member or…. More ideas available on DA website here http://debtorsanonymous.org.uk/carrying-the-message. The fellowship wants to hear from you, if you/your group need help with this or you want to share what your one action email pisupport@debtorsanonymous.org.uk. Thank you for carrying the message. The Benefits of Being a Sponsor and Working with a Sponsor in D.A. This Fellowship-wide call will explore the incredible results that members have experienced from working with a sponsor and sponsoring others in D.A. 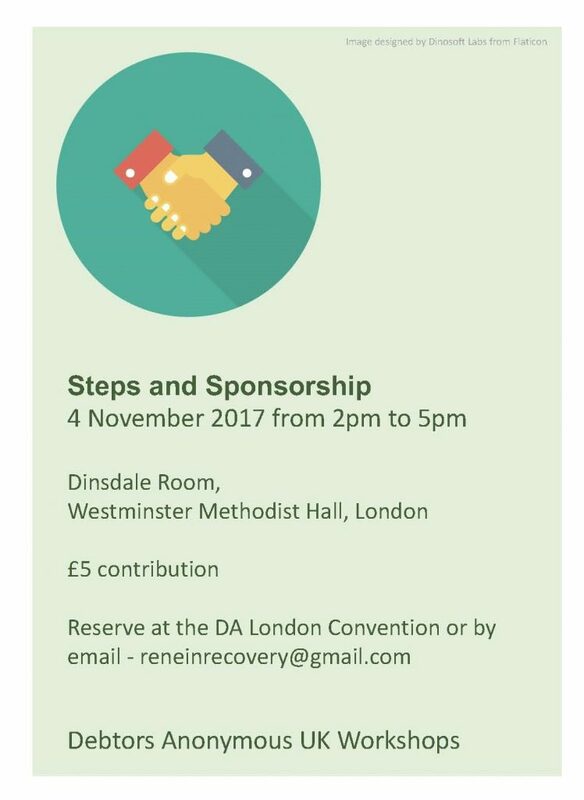 From the benefits of working through the steps to helping others with Step 1, there are great benefits to having a sponsor and being a sponsor in Debtors Anonymous. On this call a panel of three speakers who have experienced the benefits of both working with a sponsor and sponsoring others will share their experience, strength and hope on sponsorship. It is through service that we grow in spirit, experience a remission of our common disease and watch our fellowship grow. Join us and share the joy. All D.A. members are welcome to attend. Members interested in sponsorship as a path to spiritual growth and growth of the fellowship are especially welcome. D.A. members worldwide, including but not limited to Group and Intergroup Representatives, Speakers/Panelists, WSC FCC Committee members, and General Service Board members. 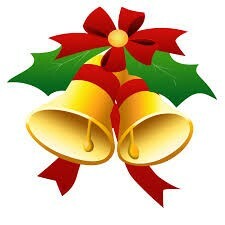 Welcome to all. Sponsorship: We have found it essential to our recovery to have a sponsor and to be a sponsor. A sponsor is a recovering debtor who guides us through the Twelve Steps and shares his or her own experience, strength, and recovery. In D.A., our purpose is threefold: to stop incurring unsecured debt, to share our experience with the newcomer, and to reach out to other debtors. Any member of D.A. can provide service and aid in reaching the debtor who still suffers. Our communication and service within the Fellowship is a means of growing spiritually and doing important service in and for Debtors Anonymous. The membership of Debtors Anonymous is wide-ranging. Our goal is to share member stories from around the world that illustrate the broad range of recovery experiences found in D.A. Our hope is that the stories will reflect the rich variety of recovery found through working the Twelve Steps and applying the program tools. celebrate the diversity that already exists in D.A. encourage members to share their unique recovery experiences. provide a forum for members to share their experience, strength, and hope regarding our common solution. There will be four speakers (sharing for 10 minutes each), followed by 20 minutes of open sharing, and 20 minutes of Q&A. All D.A. members worldwide are invited to participate. Join us to hear the variety of recovery stories found in D.A. Presented by the World Service Conference Diversity Caucus in cooperation with the World Service Conference International Caucus and the General Service Board Public Information and International Committees, to enable the broadest global participation. The mission of the Diversity Caucus is to support the Fellowship in carrying the message of Debtors Anonymous to the debtor in underserved populations and locations. We coordinate with all World Service Conference committees by developing best practices for doing service and sharing it with D.A. as a whole. A focus on solvency, good client relationships and self-care while building a successful business. What Is a Spiritual Approach to Money? receiving large amounts of money spiritually acceptable? Why Is a Spiritual Approach Important to Our Lives? A focus on trust and faith; overcoming vagueness and shame around money issues. How BDA helps live a spiritual life. DA Ireland are having a Celebration day – 41! Years of DA, on Saturday 18 Feb 2017, in Dublin. 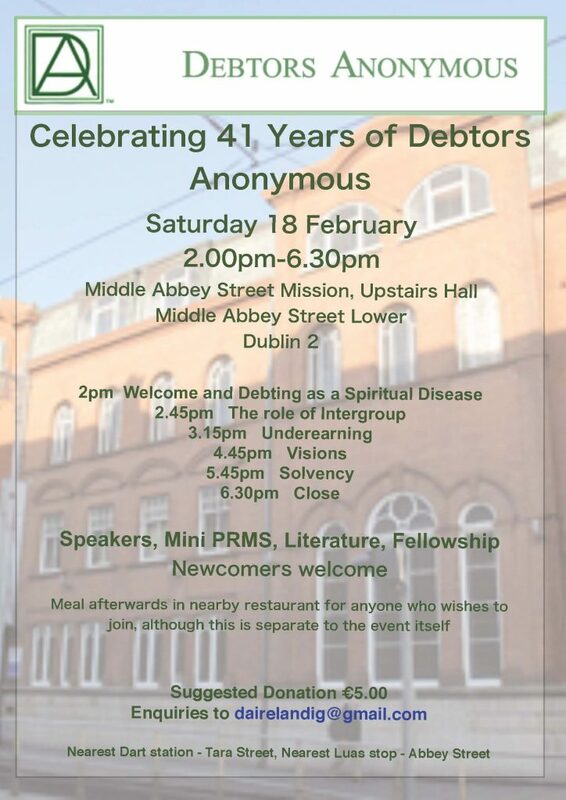 There is a usually DA meeting upstairs in the Abbey Street Mission between 12.20 and 1.20pm and then we have an afternoon of Speakers and mini PRMs between 2-6.30pm at the same venue – Abbey Street Mission Hall, Lower Abbey Street, Dublin 2. Please let your groups know in case anyone is over in Dublin and fancies some fellowship! 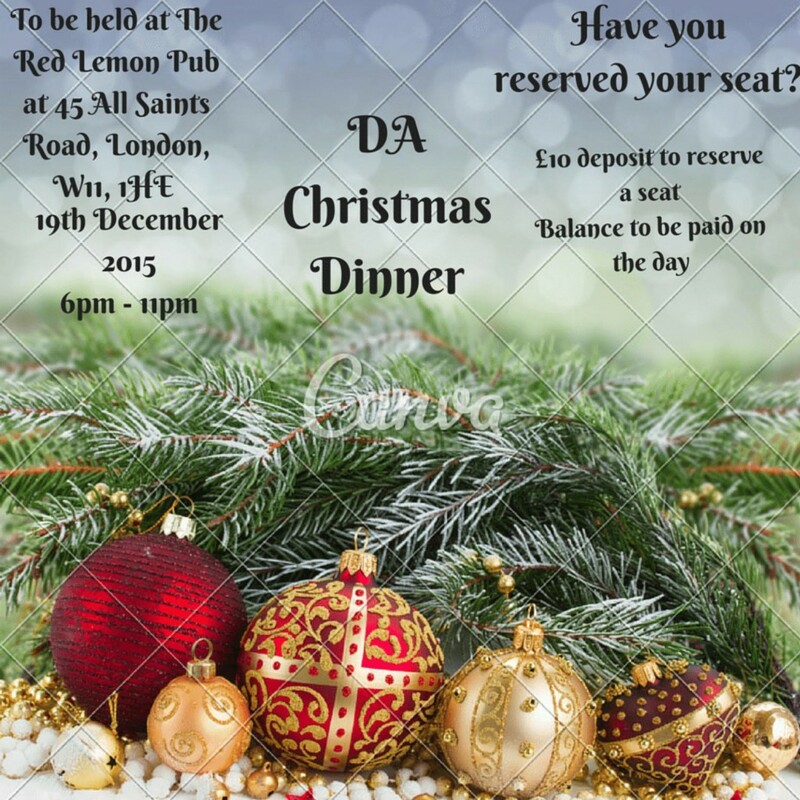 Book in advance – numbers limited to 30 – places already going! 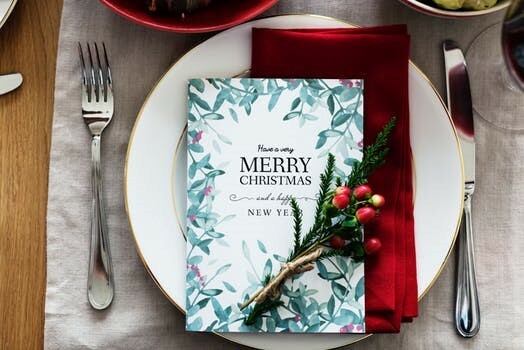 We warmly invite you to share a spicy Christmas meal with us! A special Indian Vegetarian Buffet will be served on Saturday 17th December from 2-5pm. 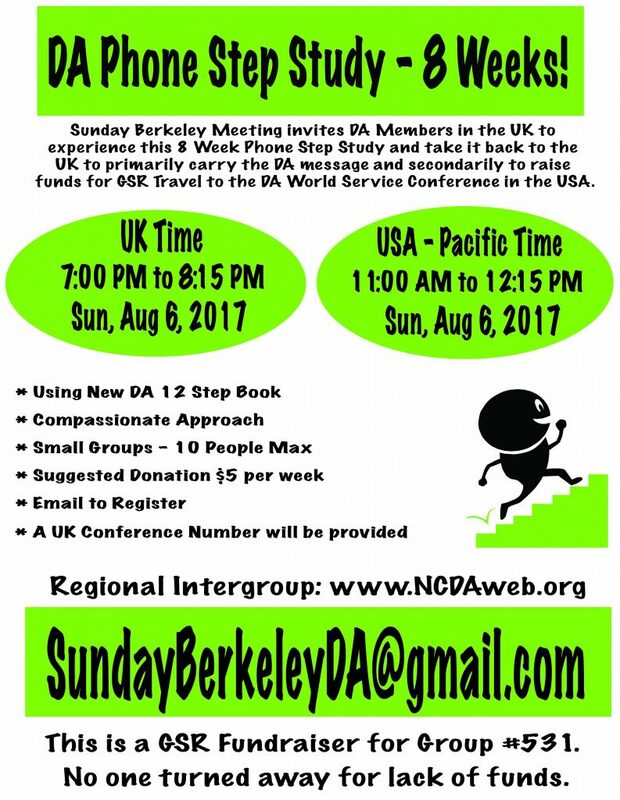 The annual DA UK Convention is almost upon us! It will be held in London on Sat 15th October 2016 at Central Westminster Hall in London. More details and a flyer for the convention are available on the convention 2016 page. The annual DA UK Convention will be held in London on Sat 15th October 2016. More details and a flyer for the convention are now available on the convention 2016 page. The Tuesday Pimlico group are hosting a series of workshops on 5th, 12th and 19th July 2016. Following the DA convention, 11 people signed up for the DA Christmas Dinner, and there are now 9 spaces left. The Debtors Anonymous Intergroup of Sacramento have asked us to mention a big DA event in California on November 27th 2015, in case anyone is in the area. A flyer is attached. On Saturday 11th October 2014, the annual DA UK Convention will take place at the Methodist Central Hall in Westminster. We are asking for DA members with experience of giving PRGs to offer 1 hour of their time at the convention. This will involve giving 2 consecutive PRGs (half an hour each). 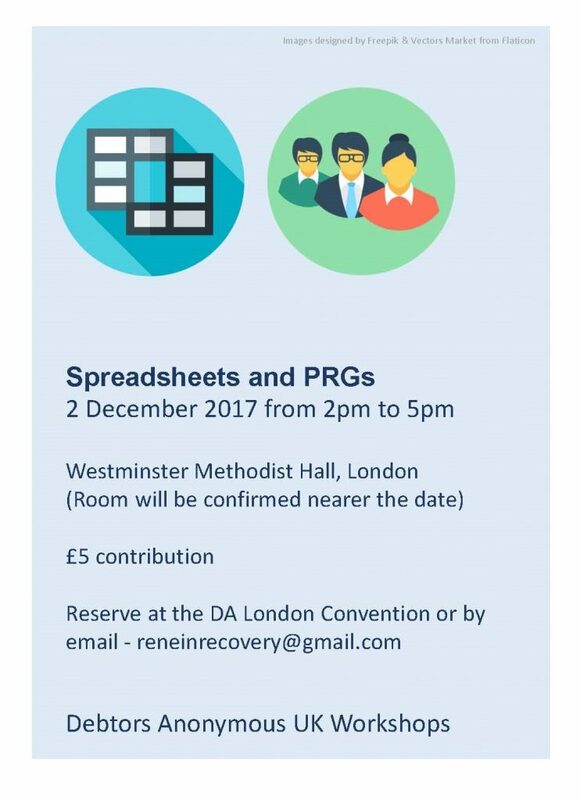 If you can be of service in this way, please email info1@debtorsanonymous.org.uk with your name & contact mobile number/ email – stating your availability to give PRGs at the convention. The DA Convention information is now at http://debtorsanonymous.org.uk/da-convention-2014. 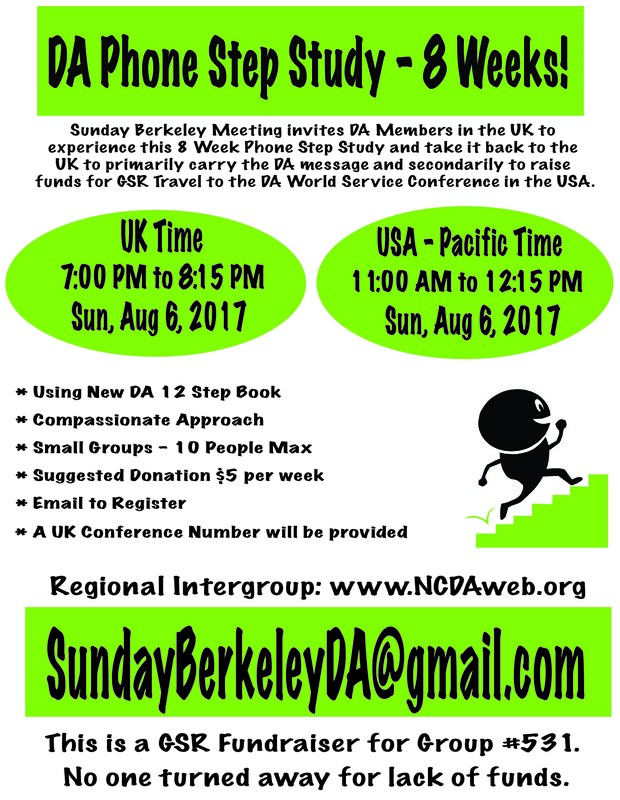 There is now a flyer for the convention that you can view and download. See main Convention 2013 page. PRG Day on Sat 6th July 2013 at Hinde St. 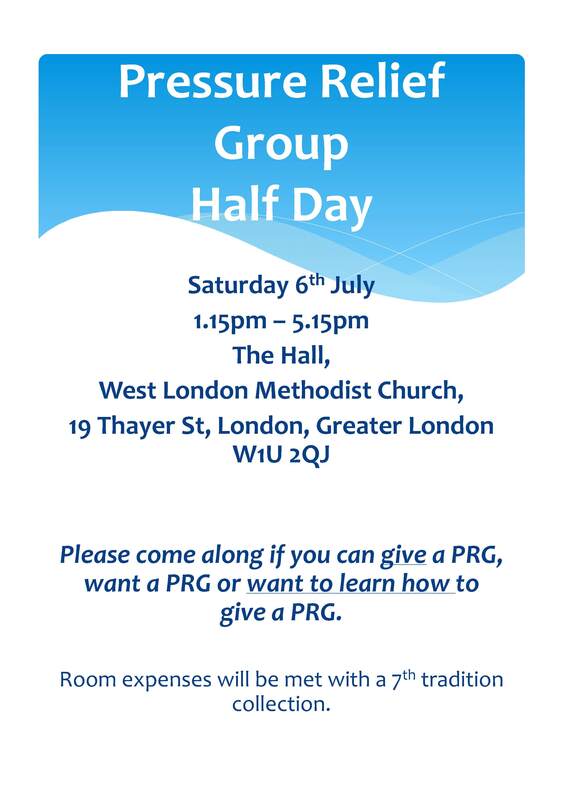 There will be a PRG day on Saturday 6th July from 1.15pm – 5.15pm at The Hall, West London Methodist Church, 19 Thayer St, London, Greater London W1U 2QJ (Hinde St Methodist Church). Download PDF poster. The 13th annual DA Convention will take place on Saturday 12th October at Bloomsbury Baptist Church. Details will be posted here. The Bristol group are holding a ‘Figures Workshop’ on Saturday 30th June 2012, to look at the mechanics of record keeping and spending plans. There may also be a session on visions. The workshop will be held at Redland Friends Meeting House, 126 Hampton Road, Bristol BS6 6BH. Drinks will be provided, but people should bring their own lunch. For more information, contact Sanni on 0117 944 6768 or at bda2sanni@gmail.com. The 2012 UK DA Convention will take place on Saturday 13th October 2012 at the Bloomsbury Baptist Church, London WC2H 8EP, from 10am – 5pm. More information will be provided when available.